"Lets look at some engine basics before we proceed. In simple terms, to make more power in an internal combustion engine you need to increase the amount of air flow through the engine. What comes in - must come out. 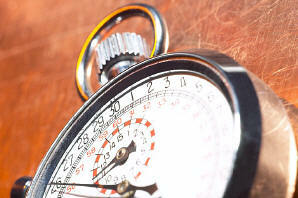 Add the proper spark at the right time, and you have more power." "When we mention power, we are referring to horsepower (HP). HP is defined as a function of torque over RPM and expressed by the following formula:"
"When measuring power, a graph of both HP and TQ is important when you are evaluating modifications to that power. It is what you will find whenever we compare stock power versus modified power. To find the HP and TQ at the flywheel, you must divide wheel numbers by 0.85. (15% loss at the wheels) for 5-speed transmission, and by 0.81 (19% loss at the wheels) for an Automatic transmission." One of the easiest way to add a few additional horsepower to your SHO is by letting more air into the system - preferably cold air. The K&N Cold Air Induction Snorkel (see picture top right) completely replaces the stock air box, putting the filter in the fender, which is the best and safest way to get cold air into your engine. This happens to be the setup I've got on my own SHO. With the stock MAF sensor, this is reported to add about 3-4 horsepower which you'll really feel when the secondaries kick in. And when those secondaries kick in - oh, what a beautiful sound! 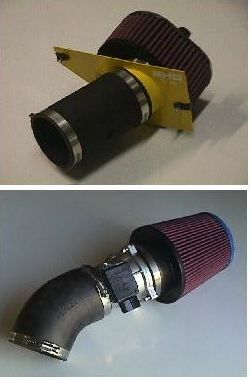 The K&N Cone Filter (see picture bottom right) also replaces the stock air box. It's more expensive than the induction snorkel, but gives you lots more air flow and a reported 6-8 horsepower. Both air filters above fit over the stock 95mm MAF housing. You can replace the stock 55mm Mass Air Flow Sensor (MAF) with an 80mm MAF sensor, but be advised that you'll also need to recalibrate the EEC-IV in order to take advantage of the new MAF. Regardless of which solution you'll use, you get a cheap increase in horsepower with minimal risk and effort. If you've got a highly modified SHO engine, a 68mm throttle body will add a solid 5 HP at the top end. 3mm secondary butterflies will give you an additional 10 Horsepower when you get over 4000 RPM on stock engines. Heavily modified engines will see even more power. This is when you remove that beautiful intake manifold we all love and force an abrasive putty through it. This smoothes the rough interior of the manifold, preventing microcurrents of air from forming. It improves the airflow to the benefit of 10 horsepower and 10 foot-lbs of torque. Highly recommended! The stock pulley system of the V6 SHO is good until the readline. Beyond that - in other words, if you're one of those people that likes to wait to shift when the rev limiter kicks in at 7500 RPM - you can burn out the bearings on your air conditioning compressor, alternator, and auxiliary pulley (ask me how I know, hmmm?). If you're serious about pushing the engine to it's limits, get yourself a set of underdrive pulleys. You'll see a 5-6 HP gain from not having to drive the accessory system too hard. If your daily drive is more stop and go rather than highway driving you might see a very small decrease in AC output. O.K., now we're getting serious... 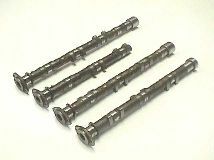 The camshaft controls the opening and closing of the vales that allow the air/gasoline mixture into your engine, and the timing of the flow of the exhaust out of your engine. Cams are designed to be most effective at a certain RPM range. Factory cams for the SHO are designed for family sedan feeling for low RPMs giving you a smooth idle and good gas mileage. You can see significant improvement in your performance by replacing your cams. Mid-RPM cams are available that will show you a 15 horsepower increase with an idle only slightly rougher than stock. If you are looking for a good top end, you can get some high RPM cams. You'll lose the smooth idle and low-end torque, but you'll see a whopping 25 HP boost at the high end. When you replace the camshaft, you should replace the valve springs, too.